ATN NVWSNAR420 Night Arrow 4-2 Night Vision Weapon Sight FREE SHIPPING! Lighting conditions will not dictate mission success when using the Night Arrow 4-2 Night Vision Weapon Sight from ATN. Ruggedly constructed to meet the demands of tactical mission work, the optic upgrade features a highly durable aluminum frame that can really take a beating. Its nitrogen-purged tube is O-ring sealed to deliver moisture-resistant operation needed for all-weather use in any field environment. Dual, fully-coated lenses have been optimized to work with an internal image enhancer to maximize the potential of every ray light and deliver a clear sight picture. On moonless nights and in complete darkness where absolutely zero light is available, a long-range infrared illuminator takes over to provide the necessary peripheral light required for clear sighting. An automatic brightness control failsafe protects both the scope and user from over exposure by automatically shutting down when too much light is present. 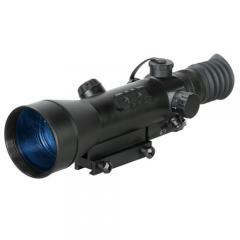 ©2002-2019 CopsPlus.com: ATN NVWSNAR420 Night Arrow 4-2 Night Vision Weapon Sight FREE SHIPPING!